Attention! Not Flat. Not Upto. It’s the Minimum 70% Off Sale on Men’s Clothing. Grab it before it disappears as this kind of deal doesn’t last long. Amazon offering Men’s Clothing flat 70% Off with free shipping, sale starts 8PM tonight i.e 16th August 2016. Subscribe Amazon Prime Free for 60 days to get free shipping or add any Amazon Fullfilled book with product to get free shipping on cart below Rs. 499. Men’s Clothing Flat 70% off. Sale on 16th August 8 – 11 PM. 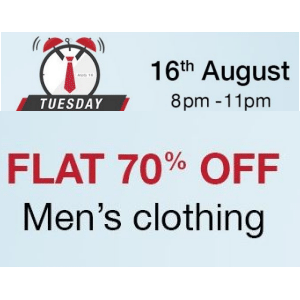 How to Buy Men’s Clothing Flat 70% off in Amazon Tuesday Timeout ?